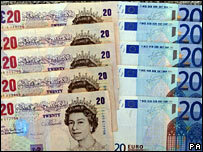 The pound has fallen to a record low against the euro, as dealers expect more Bank of England (BoE) interest rate cuts in 2008. The pound bought just one euro 37.6 cents in quiet Christmas Eve trading. "There are increasing signs that the British economy has hit a brick wall triggered by the decline in the housing market," said analysts at BNP Paribas. The European Central Bank (ECB) president Jean-Claude Trichet's recent comments have also boosted the euro. In an interview with the Financial Times, Mr Trichet hinted that the ECB was more worried about inflation than economic growth. He said that interest rate cuts in the US and Britain should not distract the ECB from tightening its monetary policy. "Other colleagues are in a different situation," Mr Trichet said. Britain's record trade deficit has also helped push down the value of sterling.